Designed for quick and easy assembly with reduced fastener construction. Three-point locking system for added security. 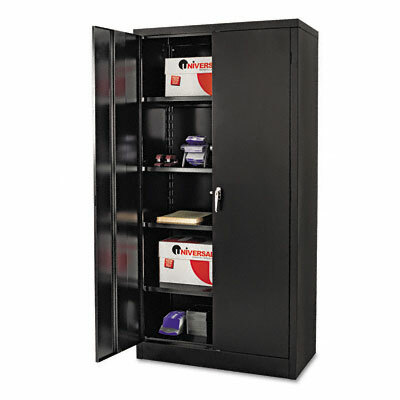 Quick-assemble 72" high steel cabinet with three-point locking bar system locks top, bottom and doors. Designed for quick and easy assembly with reduced fastener construction. Doors open 180° for easy access to contents. Cabinet made of industrial grade steel with enamel finish and satin chrome double handles. Unit has four adjustable shelves.